For additional information and how-to use videos, please visit: http://www.cad-earth.com/webhelp/Index.htm. CAD-Earth doesn't need any additional requirements from the ones needed to run your CAD program optimally (please consult documentation). What are the limitations of the CAD-Earth trial version? The CAD-Earth trial Version has a limit of 500 points when importing a terrain mesh from Google Earth™. Only 10 objects can be imported to or exported to Google Earth™. Also, all images imported to or exported to Google Earth™ have ‘CAD-Earth Demo Version’ text watermark lines. The CAD-Earth Registered Version can process any number of points and objects and the images don’t have text watermark lines. What are the system requirements to use CAD-Earth? Currently, CAD-Earth works in Windows XP, Vista, 7, 8, 8.1 and 10 in 32 and 64 bits and in the following CAD programs: Autodesk AutoCAD Full / Autodesk® AutoCAD® Civil 3D® 2017-2019. If you get any error or have any problem using CAD-Earth, you can contact our technical support department. It is recommended that you send your request by selecting 'Contact technical support' in the CAD-Earth help menu. This way, information about your computer hardware, Windows and BricsCAD version will be sent to us, with a detailed technical error description. This will help us fix the error in the quickest way possible. You can select 'Request new feature' in the CAD-Earth help menu if you would like a new function or capability to be included in the next CAD-Earth version update. If you would like, you can attach files to describe your suggestion in more detail (Word©, Excel©, DWG©, image and PDF files preferred). ***VERSION 5.1.20 01/19/2019*** Fixed insertion error when importing/exporting images, objects and terrain meshes when the drawing was georeferenced using AutoCAD commands, specifying the north axis angle different to 90 degrees or scale not equal to one. ***VERSION 5.1.19 01/07/2019*** Updated DLL and EXE files to target Microsoft .NET Framework 4 to avoid having to install NET Framework 2.0/3.5 in Windows 10. ***VERSION 5.1.18 10/29/18*** Added a function to automatically download and install Google Earth 32-bit version if it's not installed. ***VERSION 5.1.17 10/16/18*** COM registry keys added to avoid the error message 'Google Earth class interface couldn't be created" at startup. ***VERSION 5.1.13 5/15/18*** Fixed error 'mscorlib: Missing parameter does not have a default value' when importing or inserting terrain meshes from Google Earth. ***VERSION 5.1.11 4/17/18*** Fixed problem loading CAD-Earth world files when inserting georefenced images in Civil 3D. Recompiled source code to work in AutoCAD 2019. ***VERSION 5.1.10 2/01/18*** Fixed image tiles alignment problem when the terrain or 3D Buildings layers in Google Earth were activated. ***VERSION 5.1.8 12/12/17*** Solved gap between frames problem when importing images from Google Earth when the screen scale factor is not equal to 100%. ***VERSION 5.1.7 - 11/23/17*** Added option to change Google Earth graphics mode to DirectX to avoid getting white images. ***VERSION 5.1.6 - 7/19/17*** Fixed divide by zero error when exporting polylines to Google Earth with duplicated vertices. ***VERSION 5.1.3 4/10/17*** Compatible with AutoCAD V2018. Increased the default image capturing waiting time from 0.5 seconds to 2 seconds to avoid blank images. ***VERSION 5.1.2 2/2/17*** Fixed error 0x80004002(E_NOINTERFACE) when trying to connect with the latest Google Earth version 7.1.8.3036 and up. ***VERSION 5.1.1 10/26/16*** Fixed problem with incorrect polygon view extents in Google Earth when processing terrain mesh points. Fixed error reading conversion parameters in a drawing georeferenced with AutoCAD commands. ***VERSION 5.1.0 8/15/16*** Added commands to insert images, objects and terrain meshes without georeferencing, specifying insertion units and conversion to meter factor. Added option to insert and import images with relative, full or no path. ***VERSION 5.0.1 6/6/16*** Fixed error creating terrain meshes when selecting a polyline where the last vertex didn't coincide with the first. Changed default resolution to normal when importing images. ***VERSION 5.0 5/5/16*** Added support for Autodesk® AutoCAD® 2017 32/64 bits and vertical products. Added command to export terrain mesh to LandXML file, which can be imported by Civil 3D and other applications to create surfaces. Added option to group objects by layer name when exporting them to Google Earth. Fixed error when exporting heavy polylines to Google Earth. Google Earth screen is now displayed maximized when taking screenshots to import images. Fixed text language translation error in dialog boxes and messages. Fixed export objects to Google Earth invisibility problem. Fixed freezing problem when terrain meshes had more than 5000 points. Removed option to set mesh grid origin point and distance between grid rows and columns and added option to specify mesh resolution (normal, medium, high, highest) instead. If an AutoCAD drawing is already georeferenced CAD-Earth will use these parameter values and will not display a 'Drawing not georeferenced' warning message. The Google Earth web plugin interface has been removed. Now image and terrain meshes are obtained directly from the Google Earth installed in the user's computer. 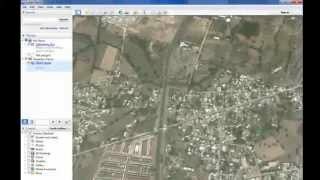 Fixed image resolution problem when importing images from Google Earth server. Changed server download mode from Server Only to Server and Cache to reduce image download time when the region has been previously processed. Added option to export text and mtext objects to Google Earth as placemark tags. Added random four letter suffix to image filenames to avoid name duplication when copying the contents of the Images folder to another computer. Fixed wrong placing of imported images and objects when the variables ANGBASE and ANGDIR had a value different than zero. Fixed incorrect image size problem when importing images in some cases. Fixed error when the program installation was cancelled at start. Fixed freezing problem in some CAD platforms when the CAD-Earth main DLL was loaded. The web message dialog box is shown as a modeless form so it doesn't interfere when a drawing is opened. Fixed error deleting files after uninstallation. -Added ability to preview position of selected drawing entities in a map when selecting a coordinate system to georeference a drawing. Drawing entities can be moved, scaled or rotated in the map until they match the site. -Fixed problem when a selected open polyline is not accepted when creating a triangulation mesh along a path. -Fixed error when imagery was not available at the zoom level calculated when importing images. -Fixed error when CAD-Earth DLL file was loaded in AutoCAD 32 bits. -Added functions to get and remove authorization keys in the License Manager typing the username and password from the License Activation Center. -The dialog boxes and 32 bit functions have been separated in different DLL processes to increase speed and stability. Added troubleshooting section to help file. Learn how to avoid misplaced images and objects. Added command to insert georeferenced images. Fixed freezing dialog box problem in some commands. Added dialog box to select which AutoCAD® based product to launch with CAD-Earth. Added alert message when the selected coordinate system doesn't correspond with the drawing coordinates when importing objects from Google Earth.